Originally, a creator refers to a ‘producer’, someone who creates something. However, as online platforms presented through social media are popularized thanks to the development of digital technology, creators are taking the center stage as a career being acknowledged by the public. The fields that creators deal with extremely vary from traveling to food and gaming. But each creator has his/her own creative contents, distinguishing one from the other. 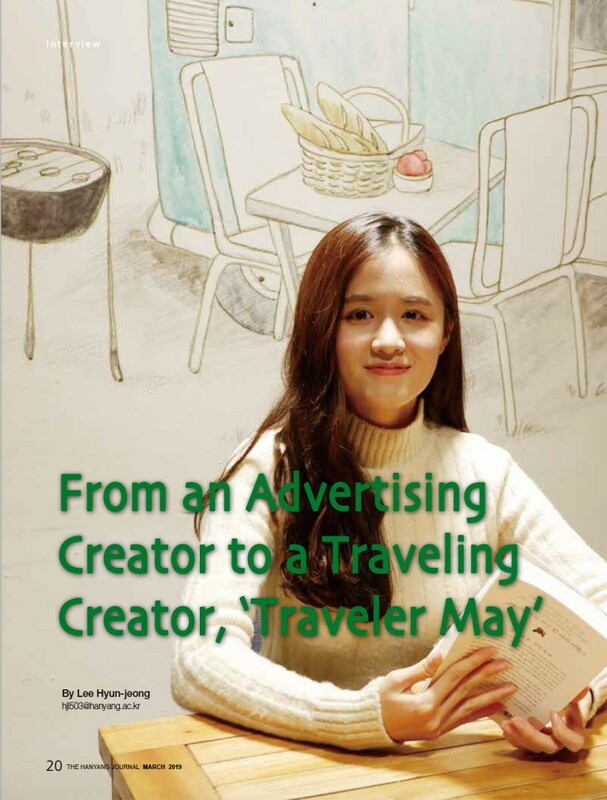 The Hanyang Journal met Traveler May, also known as Kim Mi-hee, who receives great empathy about her 244 days world travel story from lots of the youth and had a talk on the topic of “CREATE”. Q. All of your YouTube contents start with, ʻHello. This is Traveler May.’ Is there any special reason as to why you introduce yourself as ‘Traveler May’, rather than ‘Kim Mi-hee’? A. There is no special meaning. May is just my English name. When I studied in China as an exchange student, Mi-hee was ʻMayʼ in Chinese, which became my English name. The reason why I introduce myself as a ʻTravelerʼ is because I want my position to be a traveler. When I worked at a company as a manager, I always introduced myself as a ʻManager Kim Mi-heeʼ. Now, I hope to be called a traveler. Q. It is quite a challenge for you to decide to travel the world. For this, you had to quit the job as an advertisement creator. How did you decide to make that decision when there have been serious unemployment problems? A. There were multiple reasons for making the decision. I had ten million won in my bank account, and my desire for resignation was the highest at that point in time. When I was a worker, I used to imagine myself traveling, specifically after reading others’ travel stories before bed. One day, I saw a picture of a woman smiling happily at the Sahara Desert, which was something I could not even imagine doing at that time. I wanted to look back and say that I was happy in my 20s like the woman in the picture. So I immediately booked an airplane ticket and quit my job a month before the departure. That was January 2017. Q. Was the world trip your first ever journey alone? Before the long trip, did you have any worries, and what was the hardest struggle you had to overcome during the trip? A. I experienced traveling alone when I was 21-year-old while studying in China. From that experience, I found interest in traveling alone. And, of course, I felt anxious about my future after the trip and finding a job again after returning to Korea. While traveling, there were financial problems. Even though I went on a trip with 9.5 million won at first, it was not enough to travel around five continents. Thus, I sometimes had to hitchhike and sleep outside. The experience was cool and exciting, but at the same time, I still felt disappointed that I could not join activity programs as much as I wanted because I couldnʼt afford it, due to a lack of money. Q. Including Vietnam, Egypt, and Spain, you have traveled to 31 countries so far. Which place was the most impressive and why? A. Actually, my answer changes all the time whenever I get this question. Currently, I think the Sahara Desert near the Merzouga village in Morocco was the best place I have visited. The place that you can walk across the desert alone without a guide. So that made the Sahara Desert special, and it was more meaningful because I started this whole journey after looking at a picture from the Sahara. Q. I’m sure you met a lot of people from different countries in your journey. Did you have any interesting experiences while interacting with them? A. Not really. But it did change my view towards Israeli people. Personally, I met many Israelis while traveling and they were the coolest travelers. They regarded the backpacking trip as a natural experience and truly enjoyed their journey. In the past, I imagined wars or conflicts about Israel, but now I came to appreciate Israel because of their nice people. Q. When looking at your videos or books, you seem to have had time to think more about yourself during your trip. What did you think about most while traveling? Did you experience any changes in your thought processes throughout your trip? A. ‘Freedom’ has always been valuable to me. Traveling finally provided me with the time to think about the genuine meaning of freedom. I used to think of freedom as something to be pressured about. But now I try to secure minimum freedom unless it invades other fields. For example, there are some cases when I, as a creator, should accept my sponsors’ requirements. However, I try to accept them in my liberal territory rather than accepting them unconditionally. Q. You seem to have found enlightenment from your trip. But have you ever regretted traveling? A. I regretted not offering much of a congratulatory tip at my brother’s wedding. I wanted to be a nice sister who can give large amounts of tips at the wedding. But since the wedding was just after my arrival from the journey, my monetary was not that good. So I felt sorry to my brother and except that, I did not have a time that I regretted traveling. Q. Usually, you go on a trip with a backpack. What makes backpacks more special compared to suitcases while traveling? A. I think both backpacks and suitcases have different advantages. However, in the case of backpacks, your hands are free to hold anything. And by freeing my hands, I believe that I am able to fully experience the trip itself, which makes me feel more like a traveler. Q. ‘Do not lose your romanticist beliefs, even if you are poor.’ is your traveling belief. What is the meaning of ‘romanticist beliefs’ in this quote and why did you choose this as your traveling faith? A. During traveling, I skipped meals very often and slept outside due to a lack of money. Nevertheless, I could not give up drinking wine. It took a big part of my traveling romance. I did not want to lose my trip romance, although my body and mind were in bad condition. So, I kept on drinking wine for the rest of the journey and set these words as my traveling belief. Q. You are not just a traveler, but also a YouTube creator and recently you have started your life as a writer as well. What made you start YouTube and to publish your book? A. For YouTube, there was no content that posted long-term traveling vlogs at the time and I started my channel to make such content. Additionally, I wanted to make a record of my precious memories of traveling for one year by video. My book works as a substitute for stories that cannot be contained due to the nature of the videos. There are limitations in expressing my thoughts only through videos and creating a travel essay, so I decided to write a book during the trip. Q. Your first travel essay, 'Sometimes It Was Not Okay, but It Was Okay', consists of your personal feelings and emotions during the trip. Wasn’t it difficult to write your thoughts down? A. When I was traveling, I always wrote down a diary called ʻSmall Record Noteʼ, and I recorded all my own feelings here just like a diary. This made the process of writing down my thoughts in a book less difficult since everything was already there. Q. An advertising creator and a traveling creator are both creators. What do you think has changed when you were an advertising creator, compared to a traveling creator? A. When I was an advertising creator, I did my work only to please the company. Even though I made plans in advance, it became the companyʼs creation at the end. On the other hand, as a traveling creator, all the work I make is basically dedicated to myself. That is what I feel satisfied with the most in my current job. I like the fact that I can do something for me instead of for someone else. Q. As Kim Mi-hee, not Traveler May, what kind of person were you in the past, compared to the present? A. I was a person who focused on the future rather than the present. Getting a job was my only goal and at the time, I thought failing to do so meant failing in life. However, I realized that this was not the answer. I hope many students notice that there are lots of ways to succeed in life besides getting a job. Q. For you, traveling seems to have become a clear turning point in your life, both professionally and as a form of leisure. What is the meaning or value of traveling to Traveler May? A. I think it’s a happy cheat-key. In fact, there is a saying that people should travel a lot when they are young, but I don’t agree with that. While traveling anytime could be beneficial, it clearly costs money and time. But it is true that through traveling, you can feel twice as happy. That is why I think traveling is like a cheat-key. Q. Traveling is attractive as it opens up a new channel of experiences and also challenges us on what we could not easily do in our daily lives. But it also requires a lot of money and time. What would you like to say to the youth who are torn between the walls of reality and travel? A. I don’t think I can directly help to make a choice. Itʼs up to them to decide. The result is what really matters. If you choose something, you should enjoy it to the fullest and try. Never regret something that has already been done. Q. Lastly, there are many students at Hanyang University who like to travel. Do you have any recommendations for them, and is there a specific reason for that answer? A. I really want to recommend the Way of St. James. You don’t have to think which path you have to take at this place since there are yellow arrows that point to where you are supposed to go. Thus, you can concentrate solely on ‘yourself’. Because of that merit, I think it seems like a good place for college students to think about themselves while traveling.